An interactive session “My Story” with Mr. Vivek Pawar. 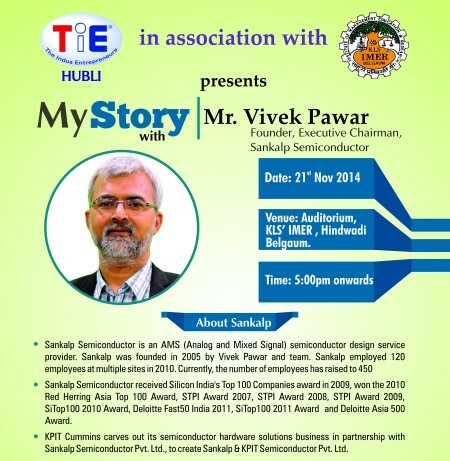 Mr. Pawar is the Founder and executive Chairman of Sankalp Semi-Conductor has been organised on 21st November, 2014 at the IMER auditorium, Hindwadi at 5.00 pm. Sankalp Semi-Conductor is an Analog and Mixed Signal semiconductor design service provider. Sankalp Semiconductor has received several notable awards including the SiTop award in 2010 and 2011 and the Deloitte Asia 550 award. IMER recognizes the need to develop a healthy institute industry interface as well as to provide a platform to the local business community and academic fraternity, the opportunity to network and exchange ideas. In this direction IMER in partnership with TIE, had organized a MY Story session with Shri Vijay Sankeshwar which was very well received.